Sophion automated current clamp utilizes a feedback regulation technique that generates the voltage needed to inject the requested current into the cell, as defined in the assay setup software. To increase measurement stability the electrical cell-chip parameters are measured for each individual measurement site before an experiment and the results are used to make individual adjustments to the feedback loop. This advanced regulation and control on individual measurement sites is only possible since we have developed our amplifiers specifically for automated patch clamp. 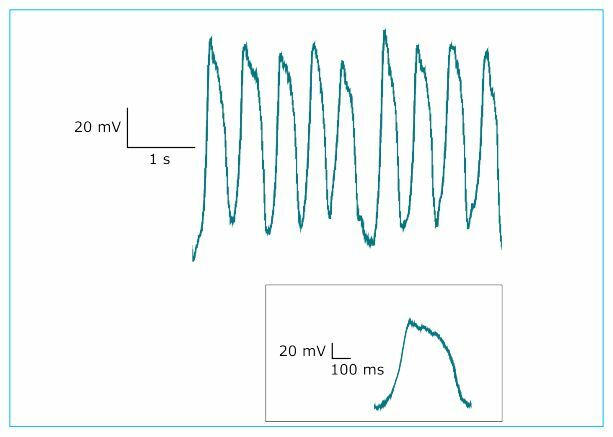 Spontaneous action potentials in HL-1 cells recorded in current clamp mode. Insert shows a single action potential on an expanded time scale. If for some reason the cell-chip parameters shifts during an experiment making the measurement site unstable the implemented clip detection function is triggered. It will return the measurement site to voltage clamp mode providing the defined holding potential to the cell. During subsequent protocols the same cell can then again be used to validate compounds in Current Clamp or Voltage Clamp or mixed Voltage/Current Clamp mode as set up in the defined assay. Save your investment in hardware. The Current Clamp feature in the Sophion amplifiers is an upgrade option. All Sophion APC solutions can be upgraded with Current Clamp when needed without need for changing or upgrading hardware.